Life may be good when you're a ninja block, but the original BOXBOY! possibly ended up doing a bit too much sneaking around when it released last year. The HAL Laboratory puzzle-platformer went completely under the radar for some people, never gaining widespread attention or shaking the eShop up with its monochromatic stylings. Now touting double the blocks, its sequel BOXBOXBOY! hopes to pick up the slack, but has it done enough to convert twice as many blockheads as before? For anyone unfamiliar with the original, BOXBOXBOY! is centered around a four-sided protagonist named Qbby and his never-ending journey from left to right. Each level is brimming with spikes, escalators, switches and lasers to avoid if you want to survive, which is where the ability to spawn sets of tetrominoes comes in handy. 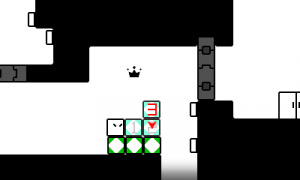 With the push of a button, Qbby can generate a set of blocks the same size and shape as himself, and use them to traverse the environment with careful thinking and some tactical platforming. 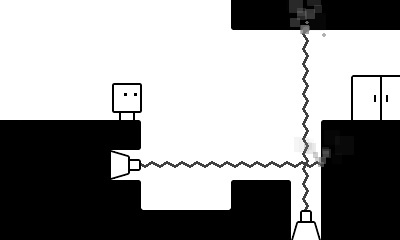 Keeping Qbby attached allows for some interesting grapple hook and snake-sliding action, but it's also possible to detach and use the blocks to create new platforms out of thin air The rules may differ at times and certain levels can toss a spanner in the works, but these are essentially the puzzle solving basics you'll need to master in order to do well. In that sense, fans of the original may be thinking that not much has changed, and for the most part that claim is fairly justified. Instead of completely re-inventing the wheel (or the box, hohoho), BOXBOXBOY! instead offers up plenty more of the same mechanics; refining and expanding on these core ideas rather than introducing a whole host of new ones. It's really more of an expansion pack than a true sequel, but with such a solid foundation to work from this certainly isn't a bad thing. The game's major - and perhaps only - innovation this time around is the ability to spawn two separate sets of blocks simultaneously, opening up a range of new possibilities for movement and puzzle solving by providing the player with twice the number of elements to play around with at once. Because of this, players will find themselves stringing abilities together at a rapid pace and getting downright experimental with different combinations. It feels as though there are multiple solutions to many of the game's puzzles, especially if you're shooting to collect the optional crowns found scattered around each level. Use too many blocks and they vanish, so no small measure of optimisation is required if you want 100% completion. It's a relaxed and thoughtful experience, even with a steady stream of new obstacles and ideas arriving as you progress from one world to the next. Movement is slow, the visuals are stripped back to their calming minimum, and there's no time limit hanging over your head at any point. Although experimentation and death go hand in hand, there are plenty of checkpoints available to ease frustration, and tapping L and R activates a quick restart when you get stuck. Should you really end up stuck, spending a 3DS Play Coin also unlocks a visual hint, which effectively shows the end state of a puzzle and leaves you to reverse-engineer the solution from that. It's a nice way to keep you engaged, especially when it's more likely than ever that you'll end up a little stumped from time to time. While Qbby makes for an endearing protagonist, there really isn't any kind of narrative to be found here or memorable characters to break up the gameplay. It's clear to see that the puzzles take center stage, as the hub world can be ignored entirely if you prefer to just tap through menus to get to the next level, and the friends you rescue along the way don't do anything other than follow Qbby around and wait for any potential sequel where they might actually be put to good use. The shop returns from the original, ready to take your hard earned points in exchange for costumes, some lighthearted comics and a variety of music tracks. More are unlocked as you play through, but most of the best costumes can only be carried over if you've actually played the original BOXBOY!. The general difficulty varies greatly from level to level, with challenging bonus worlds becoming available after completing the core game. These are supplemented by special stages that offer up puzzles focusing on specific ability-changing costumes. The bunny costume lets Qbby jump higher, for example. All in all, there's a solid 4 - 5 hours of brand new content here at an extremely tempting price point. Everything might seem a little bit more familiar to fans of the original, but the charming sheen and bubbly soundtrack hasn't entirely worn off just yet. BOXBOXBOY! doesn't exactly blow expectation out of the water - the only real change is literally in the name - but having two sets of boxes to work with makes for more interesting and complex puzzles than before. While we'd argue that previous fans will get the most out of this sequel in the long run, it's a perfectly manageable entry point for newcomers if the tight mechanics and bite-sized chunks of puzzling goodness are starting to sound pretty good this time around. Definitely buying this soon. Box Boy was fantastic fun. Picking this up once I'm done with the first game. It's pretty fun and if this is more of the same, I can't complain. NLife's review on the first Box Boy is a joke IMO. Every world adds a new interesting twist to make it a cleverly made puzzler. I'm working on the challenging Bonus Worlds now which mixes all those twists. I haven't spent a single coin (or is it diamond?) and collected all crowns along the way. I never watched any walkthrough either which makes it fun figuring your way out. I give it a solid 9. I'll start Box Boy Squared (it should have been the title of BoxBoxBoy as suggested by @DTFaux before*) when I'm done with the first one and judge it myself. 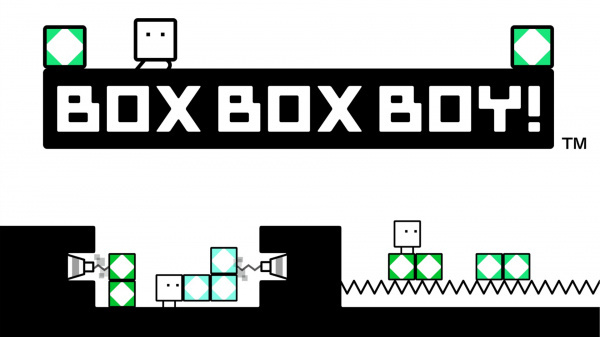 I hope they are already working on a sequel and call it Box Boy Cubed (3D puzzle platformer anyone?). Put em in Smash Bros NX. NLife's reviews for both of these games seems woefully inaccurate to me. They're some of the best games on the eShop. At least this one got a slightly better review than the first, by the time the third or fourth one comes out, maybe NLife will get the score correct. Gotta agree with sentiments shared above. This game and its predecessor are deserving of more along the lines of 8-9/10. The games are incredibly fun, especially for being so simple in style. An example would be Tumblestone (shockingly, I have an addiction growing by the hour ahhhh! wow.) which released on a non-traditional eShop day in the US yesterday, and is on-sale no less got nothing of a mention. Had it been someone sneezing while playing Pokemon Go we have gotten another of those endless updates hogging the front page. What will the third installment be called. BoxBoy Cubed? 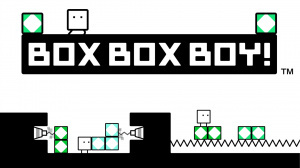 Actually, would "BoxBoy Squared" not have been a better title for this current game instead of Boxboxboy? @SLIGEACH_EIRE BoxBoxBoyBoy! or maybe BoxBoxBoxBoy! @msvt I think they used to write 2 separate reviews for EU and NA regions (especially if there was a difference in the release date). Not sure if they are still doing the double reviews but I know they did. I'm very unimpressed with this review. Reading both reviews, it seems more than obvious that the reviewer of the original game never played the whole thing and that this reviewer didn't play much of the original. Two sets of blocks could be spawned in later worlds of the original game. To suggest that is a new feature to this game is factually inaccurate. I'm getting the since that both reviewers gave this already short game a mere hour or two and then slapped a review together. Compared to the number of clickbait-esque articles and tremendous coverage of playground rumors on this site, I'm highly disappointed. I come to this site looking for good reviews and good news coverage of important or informative topics. If this website cannot provide such with good quality, I will start looking elsewhere. NL sure seems to have a high standard for $5 dollar puzzle games if this only got a 7 and BoxBoy a 6. I bought the original boxboy a couple weeks ago when it went on sale during the E3 promotion and finished it just in time for this one to come out. I've almost gotten through the game 100% (I can't figure out for the life of me, the crown in 15-3). This game, to be blunt, is an inferior mission-pack sequel of the first game with less content and no new mechanics (Recall, you could make two sets of boxes in the last world of Boxboy 1). If you liked the first one you'll enjoy this but at no point have I said "wow that's a clever solution" like I did in the first game, even with for the most part twice as many blocks. My biggest complaint about the original game, that it felt like an extended tutorial, wasn't really fixed until the last five worlds here. Honestly, if you haven't played it, I'd buy this one first and get the original second and play through them that way. I hope the next one has a level-editor, that would be neat. There's potential here but it's not reaching it. Really love this game. This and it's prequel are two gems of the eShop. Think the review is a little harsh and low scoring, but opinions is opinions. As has been pointed out, it was in fact possible to spawn two sets of boxes in the later levels of the original game. Anyway, I hope to pick this up. The original was fun, and offered quite a lot of puzzling for the money. 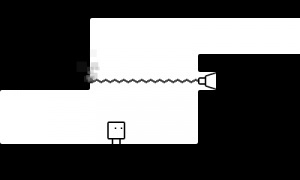 I love Boxboy. I will also love this sequel. 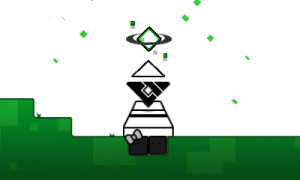 Lets hope we get BoxBoxBoxBoy sometime soon! I got the first BoxBoy, and I agree with NL's review. To me, the game is perfectly fine, but nothing to write home about. I seem to recall it was possible to create two sets of boxes in the one of the bonus worlds. How many new mechanics does this game have again? Might download someday, though I wasn't a huge fan of the original. Need to try out the original first. Had fun with the original, so I'll probably have fun with this too! ...Umm, what? That was already done in the original game. I give this review an E for effort.